This blog is about the Kaktovik Oceanography Program and the wonderful experience I had volunteering with the program in 2015. The KOP is an annual week-long natural science camp for local students in the town of Kaktovik, Alaska. It is hosted by the US Fish and Wildlife Service (thanks Greta Burkhart and Allyssa Morris), and largely coordinated by Ken Dunton’s research group from University of Texas. Students spend the week thinking about ecosystems, evolution, geology, etc., and do a lot of hands-on field work in the local lagoons and coastal habitats. Our goal was to show the participants that doing science is not only important and interesting, but also fun and a potentially viable career path. This year, thanks to an NSF grant to Brown University’s Yongsong Huang (PI), I was able to travel to Alaska to lend my geology expertise and to help teach in the science camp. The theme of the camp was “Life as an Arctic Scientist”. The pictures below will guide you through the day-to-day events of the camp. Day 1: Life as an Arctic Ecologist. Students explored lagoon foodwebs, with the goals of understanding what factors affect where/how marine organisms live, and understanding how scientists collect and analyze data to make conclusions. We made measurements of habitat characteristics such as temperature, salinity, dissolved oxygen, etc. and used a seine to collect lagoon fish. Lastly, we set up an aquarium in the classroom and populated it with flounder and 4-horned sculpin (aka Myoxocephalus quadricornis, aka Kunyuk) from the seining activity. We monitored the aquarium every day for temperature, pH, dissolved oxygen, and nitrogen concentration, and thought about why these parameters mattered and why they changed. Our classroom in the Kaktovik Community Center before camp began. 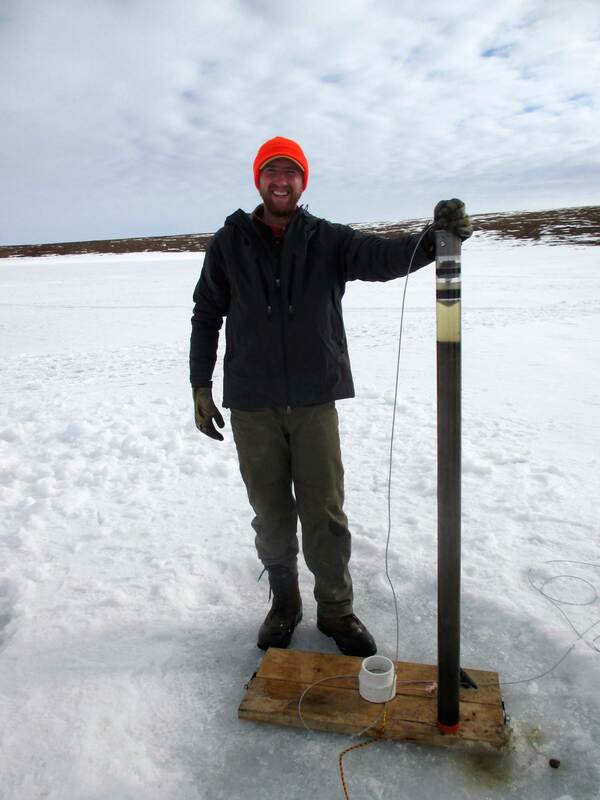 Using a YSI instrument to measure temperature and salinity in Kaktovik Lagoon. Transferring water from the Van Dorn sampler into a sample bottle, to be analyzed for nitrate and pH in the classroom. Here we are seining along the shore outside of the lagoon barrier. Don’t walk deeper than the waders! Students found much fewer fish (and no flounder) outside the lagoon compared to within the lagoon. Day 2: Life as an Arctic Geologist. On the second day, we played with MUD. Or more accurately, we played with SEDIMENT. The obectives of this day were to 1) think about the relationship between environment and sediment, 2) retrieve a sediment core from the center of Kaktovik Lagoon to see if we could observe changes in sediment, and therefore changes in environment, through time. The students tested the hypothesis that KL used to be a lake, and that some time in the recent geologic past the lake was captured by rising seas to become the modern saltwater system that it is today. Unforunately, our sediment coring was stymied by sub-lagoon permafrost about 50 cm into the sediment, so we couldn’t get very old stuff. Oh well, worth a try, and that is sometimes what life is like as an arctic geologist! UT student Carrie Harris demonstrates how to use a push-core. Yea, being a geologist means getting your hands dirty. Day 3: Life as an Arctic Ecologist Part II. The third day of KOP began with a guest presentation by USFWS researchers. Claire, Will, Gabriella, and Damion talked with the students about their ongoing project to survey wild Eider population that inhabits the barrier islands along the Alaskan Coast. Such an incredible project and a great opportunity for the students to see science in progress. Participants had the chance to try candling eggs, a method where a light placed behind an egg illuminates the developing embryo. The afternoon was marked by more hypothesis testing with the students. The goal was to compare the coastal ecosystems inside and outside of the lagoon barrier. Students made several hypotheses about how animals, water quality, and sediments might vary between these sites. Carrie and the girls cuddle up to stay warm as they watch the older students seine for coastal fish. USFWS outreach coordinator, Allyssa, is on polar bear patrol, keeping the KOP participants safe and worry-free as they seine for fish. Marking the position of the bluff edge on the north edge of the island. While giant mud hills may be an awesome playground for this Kaktovik child, they are also evidence of a growing problem for Arctic coastal villages – retreating coastlines due to increasing waves, winds, and permafrost thaw. Day 4: Life as an Arctic Hydrologist. Thursday was the first day of real school for the students, so, instead of kids coming to the community center for camp, the USFWS and UT crew went into the local school to speak with high school students. After school was out, Craig and Jeff, two UT graduate students, talked with kids about the water cycle and took them outside to try their hands at collecting soil water. Thursday evening we also held an activity night for the younger children of Kaktovik – it was a night of popcorn, juice, science-adventure-related movies and games, chaos, learning, and fun. Day 5 ; Life as an Arctic Artist. Our final day of camp was a scientific recap followed by a cultural discussion and fish printing on t-shirts. For the cultural experience, Allyssa Morris (USFWS) put together a really nice presentation about different types of food eaten around Alaska, so the kids could think about the connection between their livelihoods and the resources around them. The presentation was followed by a smorgasbord of wild game from different parts of Alaska. So tasty. Most of the kids said their favorite food was either seal or whale. I didn’t get a chance to try either, but the local fish was delicious. Fish printing, or gyotaku, is a very old tradition, originally meant as a way for fisherman to prove how big a fish they caught. While some people still use real fish for their printing, we used rubber versions of local Arctic species to make our prints. A beaded stream (and some ice polygons) visible from the airplane between Fairbanks and Prudhoe Bay. More polygons and thaw lakes from the coastal region of northern Alaska. Arctic Sea Ice. The ice was quite patchy near the coast, but was quite beatufiul. It ranged from bright white to quite dirty/dark. Jawbones of bowhead whales laid out along Kaktovik Lagoon. A smokehouse in Kaktovik. Smoked fish is a staple food for many people. This room smelled sooo delicious. This is mostly Arctic Char. Here the USFWS crew is in full mustang suit gear, heading out for a 4 day camping excursion to survey eiders. And that wraps up the highlights of the 2015 Kaktovik Oceanography Program and my time in Kaktovik. Thanks!